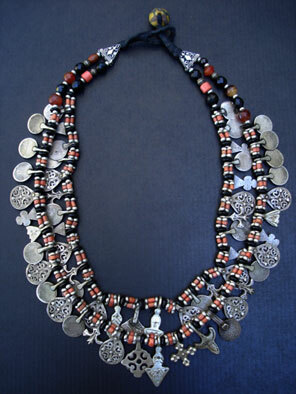 A sensational double strand necklace of coral onyx and silver featuring 57 old silver Berber pendants. The 4 clover shaped pendants are metal but all others are highly sought after silver elements. A longer style necklace but still comfortable to wear considering the amount of silver. Finished with hand woven cotton and an old African King trade bead button.